By the end of December 2017, there was 37.23 million square meters of solar thermal products installed, a 5.8% decrease from 2016. Vacuum tube products installed totaled 31.46 million square meters, and flat-plate collectors and systems installed totaled 5.77 million square meters. 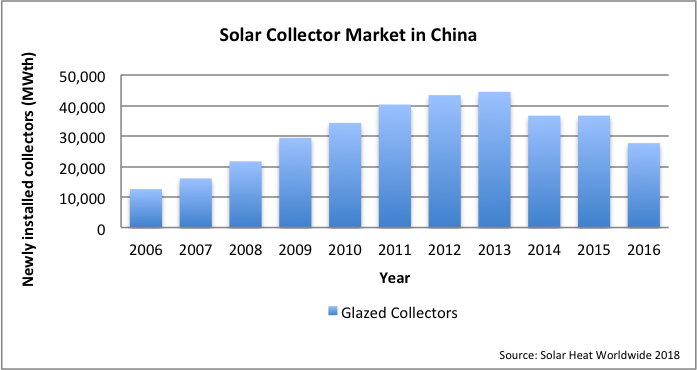 Vacuum tube solar collectors and systems represent 84.5% of the total market and flat plate collectors about 15.5%. In rural areas without natural gas and centralized heating systems, the convenience and cost of solar water heaters are the main market drivers because using solar water heaters can save the conventional fuel fee. In the urban market, the main driver is local regulation or national regulation. To help reduce greenhouse gas emissions, the Chinese government published a series of regulations to increase the proportion of renewable energy for all energy consumption, which includes the promotion of solar thermal applications. Most solar manufactures are located in eastern China. Fifty percent of the manufacturers are centralized in 3 provinces: Zhejiang, Shandong and Jiangsu. In 2014, the annual amount of exports was near USD 300 million. The most general mode of product sales is three-tiered: the manufacturer, distributor, and the retailer. For some compact products, such as solar water heaters, the installation is the responsibility of the seller, and for the large construction projects, the manufacturers have specific departments in charge of the installation work. There were 3,500,000 people engaged in the solar thermal industry at the end of 2011, most of them worked in the field of solar water heating, which represented about a 90% share of the whole industry. A typical compact solar water heater (generally with 2 m2 collectors and a 150l tank) is about 3,000 to 5,000 RMB Yuan, including the installation charge. For a solar hot water system, the cost is about 1,500 to 2,500 RMB Yuan per square meter collector. For a solar space heating system, the cost is about 3,000 to 5,000 RMB Yuan per square meter collector. Solar district heating is becoming a new area of development for solar thermal systems in China. Over 10,000 square meters collector area of systems has been built. Besides district heating system, solar + heat pump heating system for single house is a new trend in China. The passive house is the most common solar energy building, especially in the rural areas of northern China. This type of house appeals to many people because of the large southern windows and the possibility for an attached sunspace. Due to the promotion of "nearly/net zero energy building" (NZEB), daylighting, solar heating and cooling are becoming new focus areas. The new building areas in China will continue to increase in the coming years. The existing building area is over 40 billion m2, where more than 2 billion m2 of buildings need energy-saving renovation. There is an enormous building market in China. The main market drivers are the policies for reducing building energy consumption. The Chinese government plans to reach the target of 15% renewable energy consumption of total energy consumption by the end of 2020. Solar energy applications are one of the important ways to realize this energy saving goal. According to the construction experiences, a well insulated passive house with attached sunspace costs about 40,000 RMB Yuan more than the common residential building in rural areas of northern China. China has a series of science and technology programs, such as a national five-year plan, National High-Tech R&D Program (863 Program), National Key Technologies R&D Program, etc. Most of these include solar energy research, and some include solar thermal technology research. China is working hard on the research of solar cooling system. CABR built an office building of nearly zero energy building in 2014 and the solar heating and cooling system contributes about 50% of the heating and cooling energy. China has a medium-term and long-term plan for renewable energy application. The target of the solar water heater installed capacity is 300 million m2 and total substitution to conventional energy from all solar thermal technology application is 60 million tce (ton coal equivalent) by the end of 2020. At the national level, the Ministry of Science of Technology is responsible for all national S&T programme, and the local S&T commission is responsible for a sub-program at the local level. For national S&T programme, MOST (Ministry of Science and Technology) and MOF (Ministry of Finance) will offer the financial support to the responsible organization, and each research project may get millions RMB Yuan. From 2009 to 2011, a total of 72 cities and 146 counties passed the national selection and became demonstration cities, each of them can receive 50 million to 80 million RMB subsidies. According to the standard, testing, energy label, and energy efficiency subsidy system, China central government will give 5 billion RMB Yuan (0.8 billion USD) to users who buy DSWHs labeled with 1 or 2 grade within one year (before 31th, May 2013). Some local regulations stipulate the new building must apply the solar energy to provide domestic hot water. In 2017, Chinese government pushes clean heating in northern China, encouraging the use of clean energy, including solar thermal, instead of coal for space heating. The central government will give the first 12 demonstration cities an annual clean heating subsidy of 300 to 500 million yuan for 3 years. CNREC is the national institution for assisting China’s energy authorities in renewable energy (RE) policy research, and industrial management and coordination. CNREC will research RE development strategy, planning, policy and regulation; coordinate, regulate and implement industrial standardisation; keep track of the development trend for RE industry and technology; push the establishment and improvement of the system for RE technology and product testing and certificating; implement, monitor and assess national pilot projects; manage and coordinate international and regional cooperation, etc. CSUS-GBRC was founded at July 20, 2009, by the resolution made in Working Conference 2009 of governing units, member units and secretary-general of CSUS. It’s a R&D department directly under CSUS.